Where it’s from: The originated from the U.S.
How to grow it: Sunflowers are really easy to grow. You can plant them in the ground or in a pot in your house. They always grow toward the sun. Interesting Facts: [Scientific Name] Helia means sun and Anthus means flower. 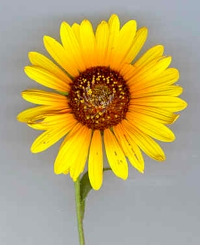 One sunflower has up to 2,000 seeds in it. There are sixty different kinds of sunflowers. 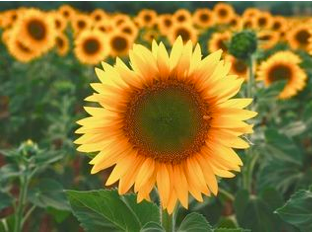 The common sunflower can grow 3 to 18 feet. It only requires 90 to 100 days to grow. There are two kinds of sunflower seeds. There are black seeds and striped seeds. 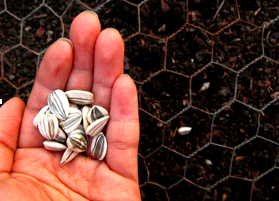 Oil is made from black sunflower seeds. Snacks are made from the striped seeds. The sunflower is the state flower for Kansas. There is only one flower to each stem.